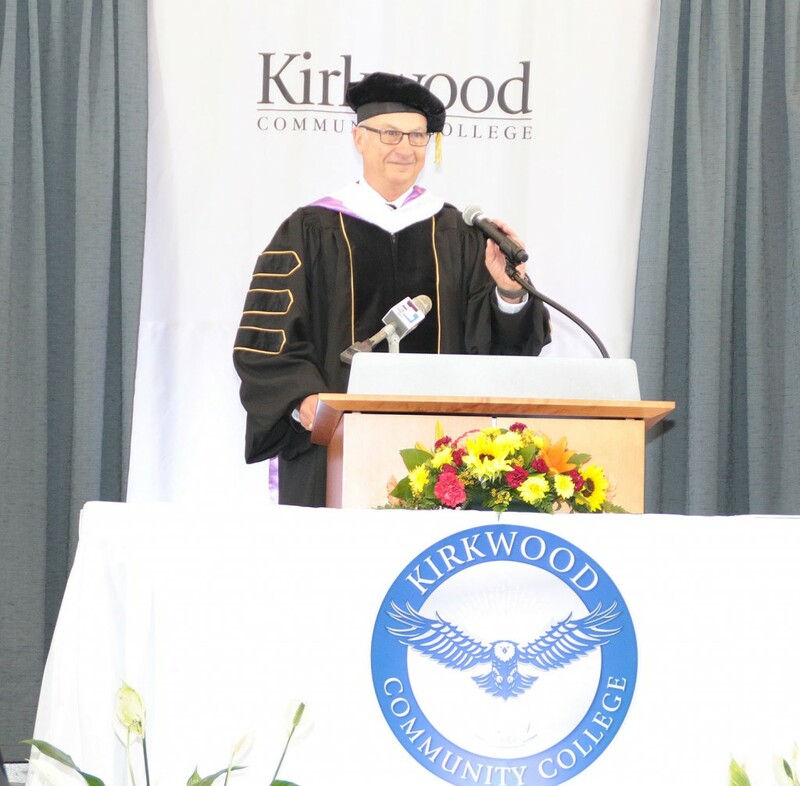 On Nov. 6, Kirkwood Community College was abuzz for something other than being a local polling place on a pivotal Election Day. 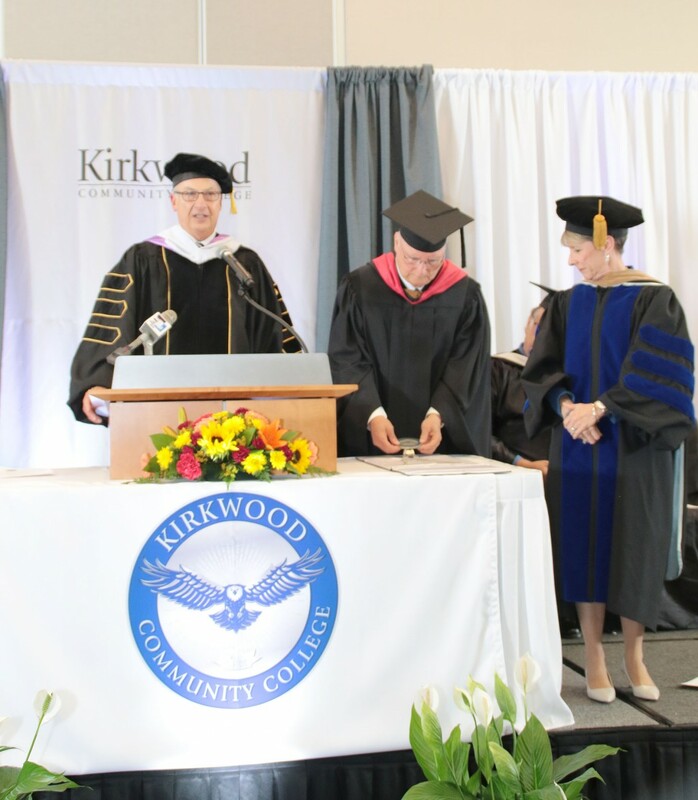 The Hotel at Kirkwood played host to esteemed guests including the board of trustees and alumni as well as present and past faculty, staff and students for the inauguration of the college’s new president, Dr. Lori Sundberg. Exactly one year prior to the ceremony, Dr. Sundberg began the journey that would start with an interview and lead to her making history on campus as the first female president. The late afternoon festivities began with a processional through the ballroom as the Kirkwood brass ensemble played “Aida” by Giuseppe Verdi. 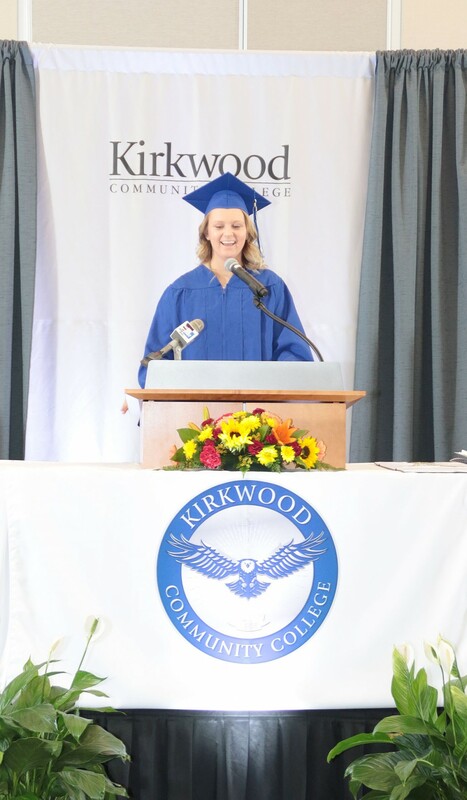 Liberal Arts/Health Services major Taylor Loew spoke on behalf of the students, also agreeing that the feeling of home, sincerity and personal attention received on many levels were the key pieces of her admiration for and success at Kirkwood. “Now that President Sundberg is here, I know this college has found the right leader to take it into the future… a new president means a new perspective and that means the college I know and love will only get better,” Loew said. Teri Copler, a partner at TrueNorth Companies, represented the alumni as a graduate of the class of 1980 and credited the college for the vital role it played in her obtaining her achieving her goals. Copler also expressed her pride that as the first female president, Dr. Sundberg will be a leader who continues to break gender barriers and encourage others to stand strong in the face of adversity. “If her career path is any indication of what’s to come, I expect exciting things for this college in the near future and beyond… I can’t wait to see what President Sundberg can do,” Copler told the audience. The keynote speaker for the event was Dr. Christine Sobek, who is not only the president at Waubonsee Community College but is also a former colleague and long-time friend of Dr. Sundberg. 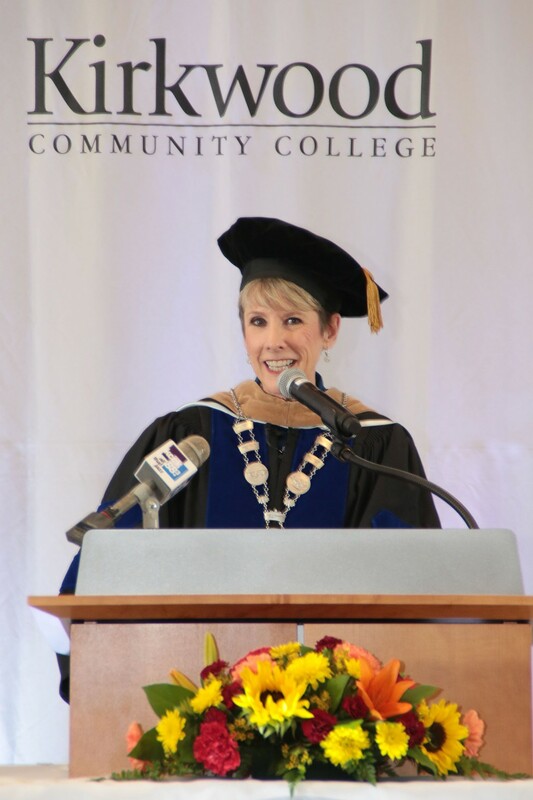 Sobek spoke of personal and business ties that forged not only her relationship with KCC’s president but also grew her appreciation and admiration for the college and community. 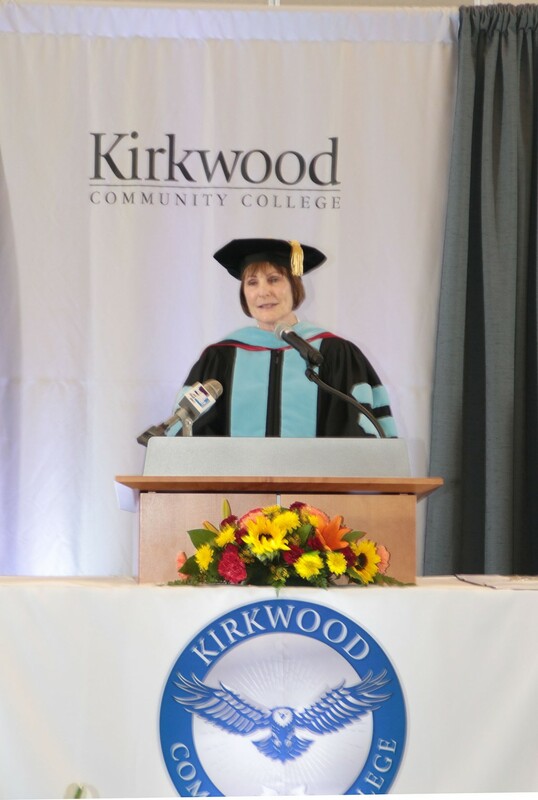 “When Lori shared with me she had been selected for this job, I was absolutely thrilled because I knew she was coming to a marvelous place, a marvelous community and I knew that Kirkwood was receiving an excellent leader who would who will take Kirkwood and this community to an outstanding future,” said Sobek. The Presidential Medallion was presented to Dr. Sundberg by Mollenhauer with Lamb narrating its meaning and purpose, which is the shared relationship between the president and the board of trustees. 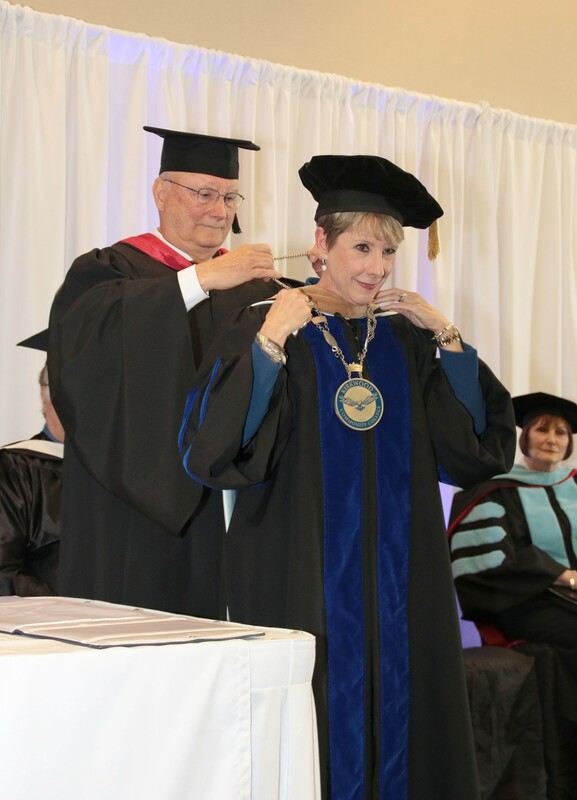 Wearing the medallion around her neck, President Sundberg thanked the audience and speakers as well as her family, friends and colleagues before settling into her inaugural speech. 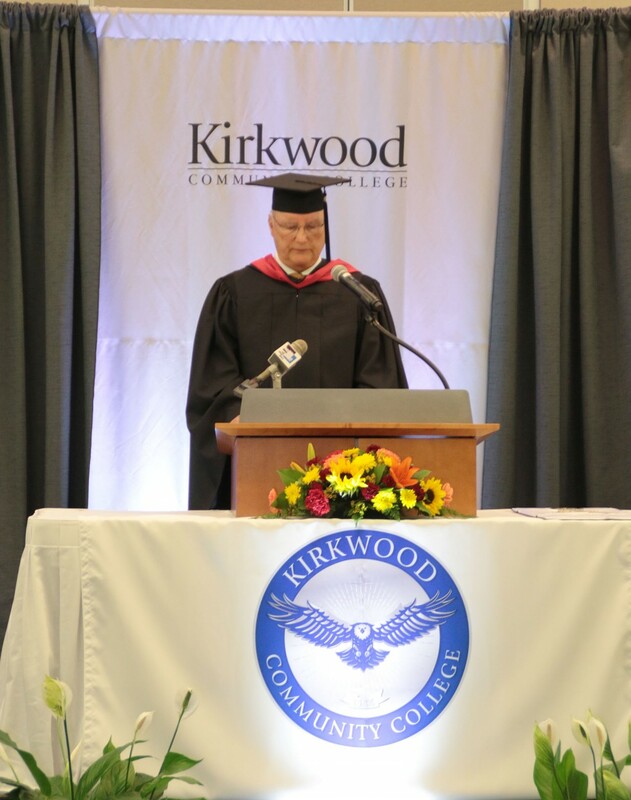 “Kirkwood is a remarkable institution and I want to build upon the foundation that has already been laid... I am deeply honored to stand before you today and I pledge to all of you to lead this award-winning institution to even greater heights through my commitment to integrity, transparency and excellence,” Sundberg said. 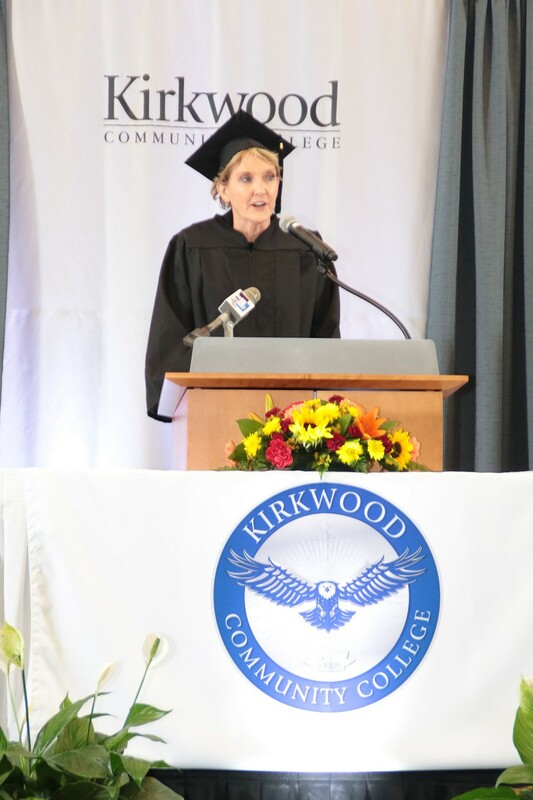 Sundberg spoke of her goals and efforts that are already in motion for making as college accessible, affordable, seamless and successful for as many as possible. 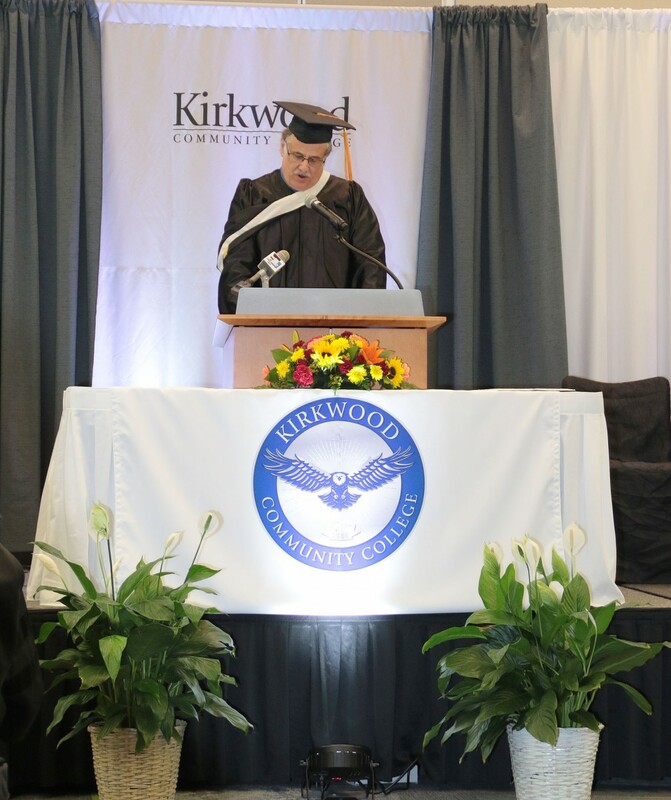 “As I look to the future at Kirkwood, I am inspired by what I see… under my leadership I know we will continue our legacy because that is what it means to be Kirkwood and there is nothing we can’t accomplish together,” Sundberg said in closing. 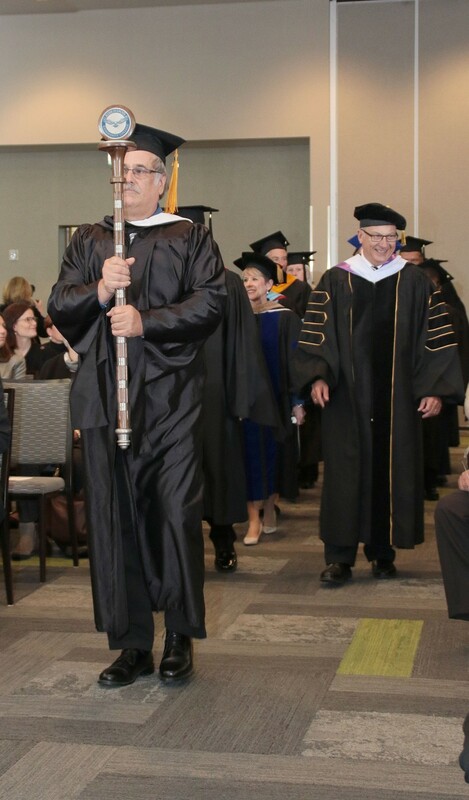 The conclusion of the event consisted of final remarks by Lamb, a recessional parade and fellowship in the atrium. Newly inaugurated President Dr. Lori Sundberg gave her inagural address on Nov.6. PHOTO BY JEFF SIGMUND. Processional on Nov 6. PHOTO BY JEFF SIGMUND. Dr. Bill Lamb Vice President of Academic Affairs gives a welcome and introductions at the 5th Presidential Inauguration on Nov. 6. 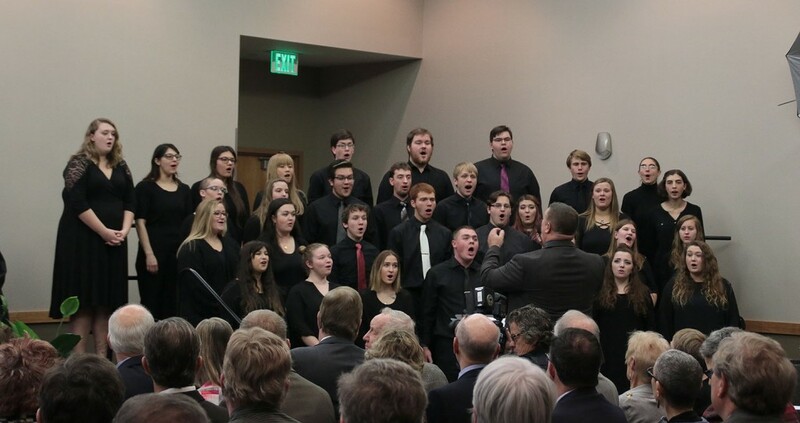 Kirkwood Concert Choir under the direction of Dr. Fred Kiser performs during the welcoming. PHOTO BY JEFF SIGMUND. Jim Mollenhauer Board Chair, Kirkwood gives opening greetings. PHOTO BY JEFF SIGMUND. Rich Underwood Kirkwood faculty Association, Chair Elect gives greetings on behalf of the faculty. PHOTO BY JEFF SIGMUND. Taylor Loew Liberal Arts gives greetings on behalf of students. PHOTO BY JEFF SIGMUND. Terri Copler 1980 graduate gives greetings on behalf of Kirkwood alumni. PHOTO BY JEFF SIGMUND. Keaynote Speaker Dr. Christine Sobek President, Waubonsee Community College speaks on Dr. Lori Sundberg past accomplishments. Dr. Lori Sundberg awaits to receive the Presidential Medallion from Jim Mollenhauer as Dr. Bill Lamb speaks. PHOTO BY JEFF SIGMUND. Dr. Sundberg receives the Presidential Medallion from Jim Mollenhauer Board Chair. PHOTO BY JEFF SIGMUND. 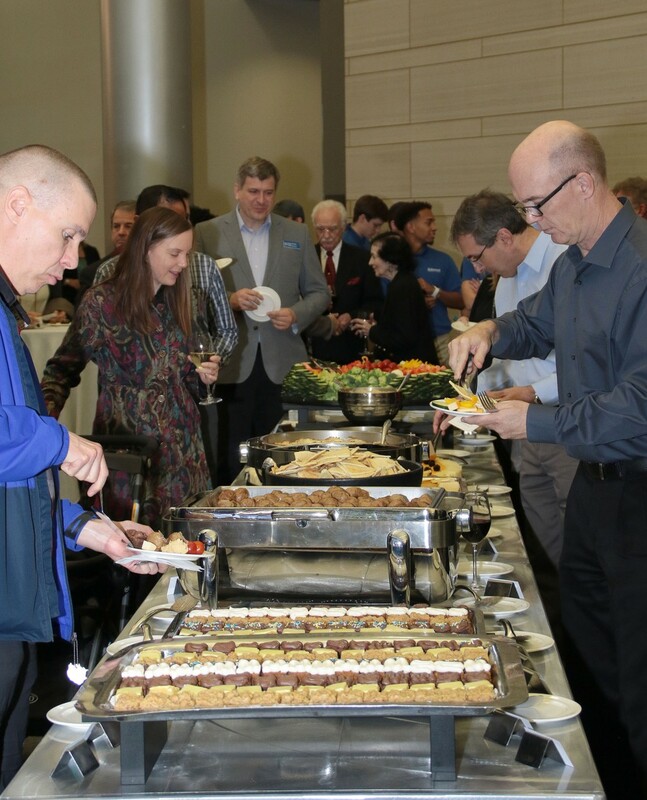 Guests enjoy food provided by Hotel at Kirkwood during the reception. PHOTO BY JEFF SIGMUND.